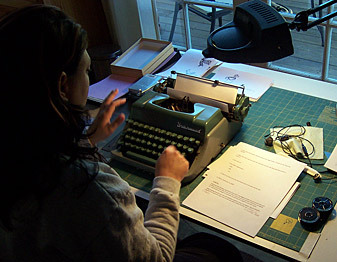 Carol is working on a new book, and in an effort to make it as labor-intensive as possible, she is actually typing out the text on each finished page (hundreds of them) by hand on an old Underwood typewriter. This makes a clack clack clacking sound throughout the house, that was probably a very familiar sound years ago, but it pretty unusual these days. That made her laugh pretty hard, so I thought I would share it with you to bring some joy to your dreary football Sunday.